The ONLY height adjustable, stackable, revolving storage carousel! This storage carousel keeps your kitchen counters and pantry organized! 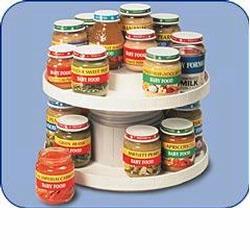 Baby food jars, bottles, cans and spices fit neatly onto the rotating trays. The distance between trays is adjustable to fit all size containers and to maximize space in crowded cupboards.